Get your party started with upbeat and energetic Invitations that twist and shout about your next event. These Disco Invitations are sure to catch attention with their vivid colors, twinkling disco ball, and dancing silhouette. Customize invitation templates from TicketPrinting.com and invite all of the Disco Divas you know to come Shake, Shake, Shake – Shake their Booty! 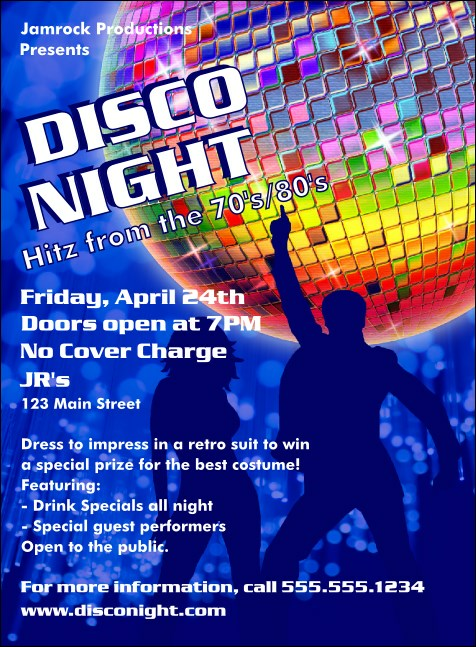 This Disco Invitation is part of our Event Kits package that includes matching promotional materials so that everyone knows about the dance party event of the year!